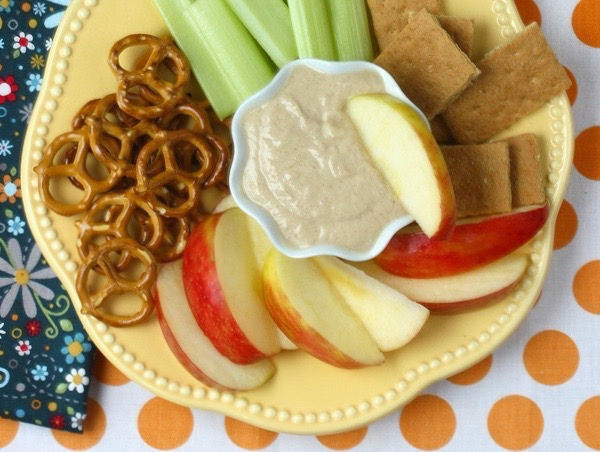 As kids across the country head back to school, parents are scrambling to get back into a healthy mealtime and snack routine. 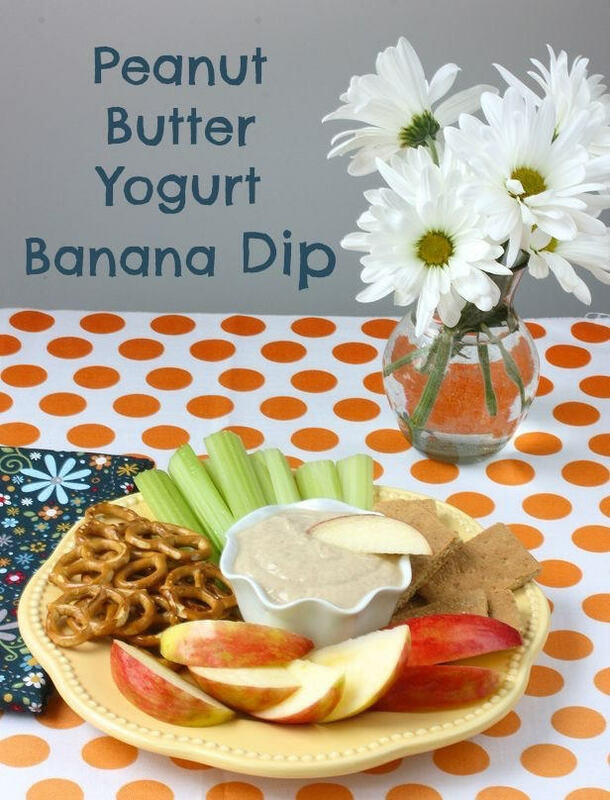 To make that daunting task a tad bit easier, try this easy and nutritious Peanut Butter Yogurt Banana Dip. Got picky eaters? No worries: They’ll love it. Look at all those fun, kid-friendly dippers! Say it ain’t so! Summer is coming to an end, and it’s back-to-school time … already! 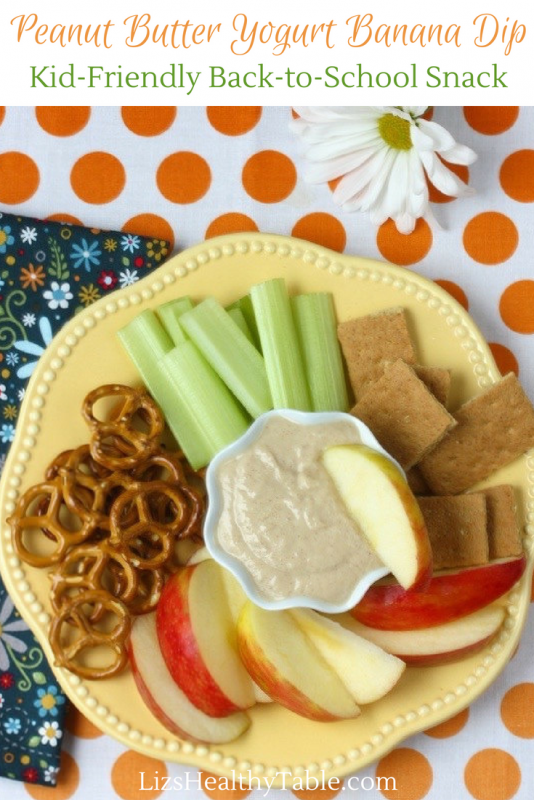 Looking for a healthy new snack idea the whole family will love? Give my yummy dip a try. Made with calcium-rich yogurt, peanut butter, and banana, it takes just minutes to assemble. 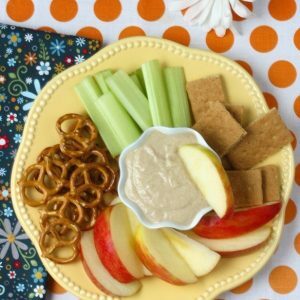 I suggest you serve this creamy dip with nutritious dippers including sliced apples (or peaches), celery sticks, Graham crackers, and whole grain pretzels. Peel the banana, place on a cutting board, and mash with the back of a fork until smooth. Place in a medium-size bowl with the yogurt, peanut butter, and cinnamon and stir until well combined. 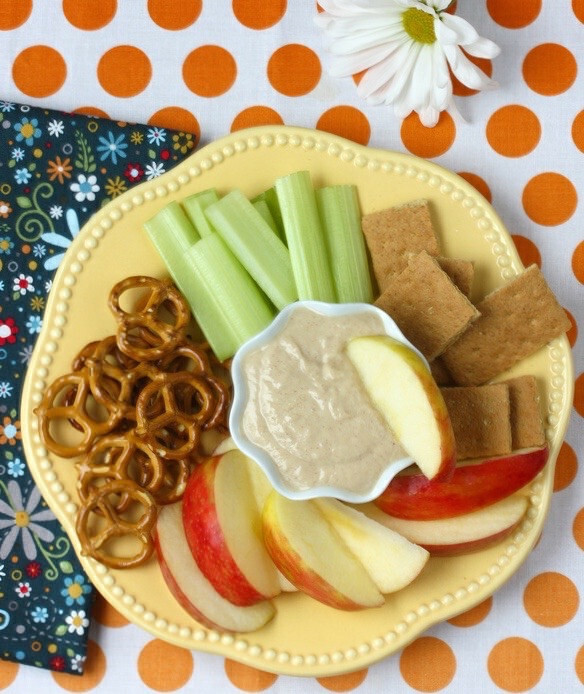 Transfer to a small bowl and serve with sliced fruit, celery, Graham crackers, and whole grain pretzels. I first created this recipe for the summer issue of the Live Well Digest, a WIC publication created by Brush Arts. I hope you like it; please weigh in with your family’s favorite snacks. This is the perfect snack for my little girl who loves yogurt. Love how simple this is….and nothing I’ll need to run to the market for. Thanks MMM. Love this! I make this all the time for ME 🙂 LOL! I use powdered peanut butter though b/c I have a slight obsession with it 🙂 Thanks for sharing! This looks so simple and delicious! I know my little girl will love it!